Whilst car adverts feature dogs peering out of open car windows in their ads - most car owners wouldn't allow it. WeLoveAnyCar.com dog owners survey also finds motorists talk to their dog in the car and 72% seek canine approval on its replacement. Car adverts abound with deliberately cute looking pooches peering out of open windows with wind blowing their ears sideways whilst the driver speeds along. 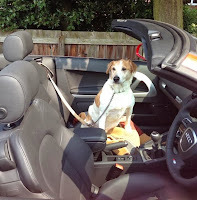 The WeLoveAnyCar.com dog owners survey found that 62% would ‘never’ let their dogs hang out of cars whilst on the move and disapprove of the practice. 22% would only allow their dogs to peer out of open windows if restrained or held by another passenger. The government and the RSPCA clearly advise dog owners to take care when transporting their dogs and all recommend a dog is restrained in some way – something car advertisers need to take note of when designing their dog friendly adverts. The now famous Volkswagen dog ( #woofwagen ) adverts show dogs peering out of windows and close analysis shows all are restrained but this may not immediately be clear. A spokesman for WeLoveAnycar.com - the biggest car review site in Britain, said, “Award winning adverts featuring dogs have won the hearts and minds of the public. But car and dog owners are not looking for accolades; just a safe car for their family and that clearly includes the family dog." In a survey of 2000 car owners, those that owned dogs were found to be a breed apart when it comes to their dogs and advertisers are spot on in singling them out for attention. Only 4% took their dogs in the front seat - 29% in the back seats and rest in the estate or hatch back. On a lighter note, 96.2% of owners talk to their dog in the car – often sharing their opinions of other drivers' abilities. The remainder will only talk to their dog if no one else is in the car. That means that ALL dog owners talk to their dogs on the move. WeLoveAnycar.com is the UK's largest car review site and combines the opinions of over 240,000 car owners. Reviews are by invitation only to known car owners. 50% of all cars reviews are made by current owners, with the remainder being submitted by people who owned that make and model recently. This mix is to ensure balanced reviews are provided. WeLoveAnycar.com recognises the care and responsibility taken by car advertisers who feature animals in their adverts. The dog survey is ongoing and was initiated on 5th November. The survey was only sent to known car owners.